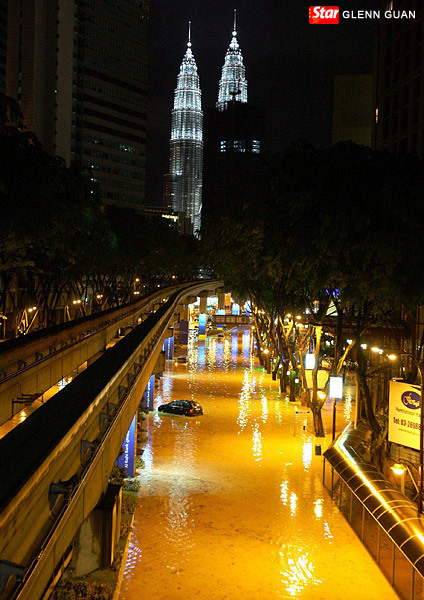 Kuala Lumpur Metblogs » Rain: A SMARTing pain? Words may have different meanings. And some may be misleading, especially the acronym for the city’s RM1.9bil (USD543mil) Stormwater Management and Road Tunnel — SMART. 7.	quick or prompt in action, as persons. 8.	having or showing quick intelligence or ready mental capability: a smart student. A main road in the heart of the city, Jalan Sultan Ismail, submerged. In the background is the city’s signature skyscraper, the Petronas Twin Towers. Photo by GLENN GUAN/The Star on flickr.com. For the folks in the Klang Valley, the question is can the flood tunnel, when fully completed, be able to resolve Kuala Lumpur’s flood woes, after having spent over RM1.9bil without taking into account the other millions used up for flood mitigation projects. Flash floods or storm floods are the same to us because it is just air banjir. 1.	to be a source of sharp, local, and usually superficial pain, as a wound. 2.	to be the cause of a sharp, stinging pain, as an irritating application, a blow, etc. 3.	to feel a sharp, stinging pain, as in a wound. 4.	to suffer keenly from wounded feelings: She smarted under their criticism. 5.	to feel shame or remorse or to suffer in punishment or in return for something. So what does SMART really mean?